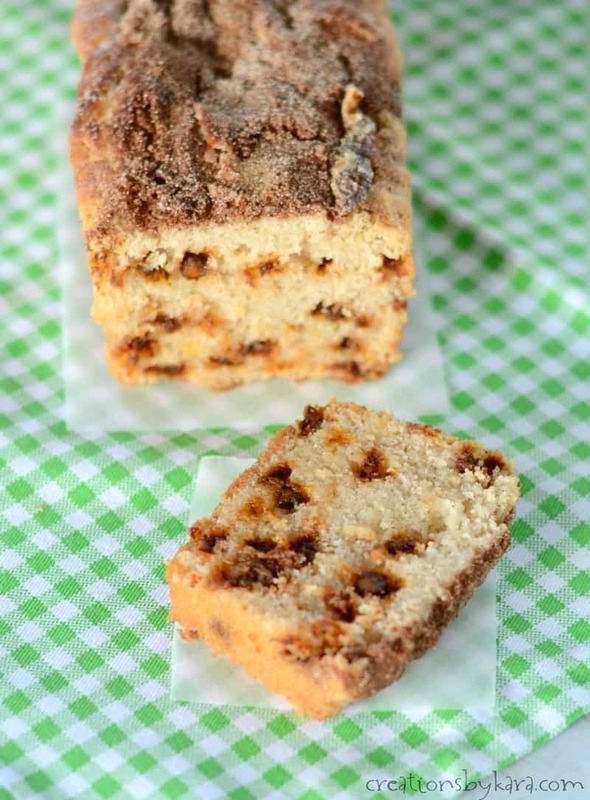 This Snickerdoodle Bread gets RAVE reviews every time I serve it! 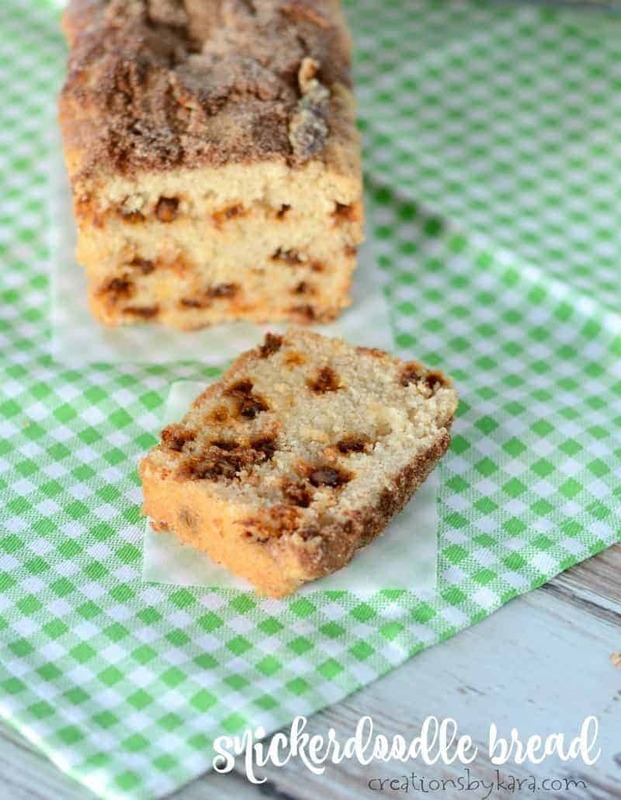 Loaded with cinnamon chips and sprinkled with cinnamon sugar, it is irresistible. My boys went back to school yesterday, and man oh man am I missing them. I am NEVER ready for school to start. This year we were actually finishing up school shopping at almost 9:00 on Monday night. Yep, mother of the year award right here. Sheesh! Thankfully, they all had great first days, and are looking forward to the school year. In order to make up for my lack of back to school preparations, I am trying to have fun snacks ready when the boys get home. Next week they’ll have to eat fruits and veggies, but for this week it’s all about yummy. 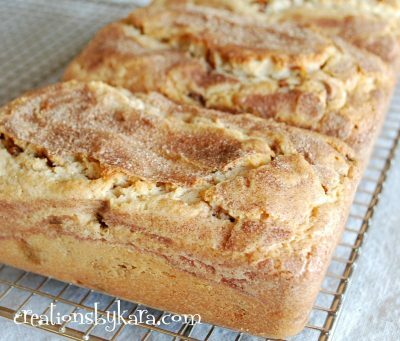 This Snickerdoodle Bread fits the bill just perfectly. 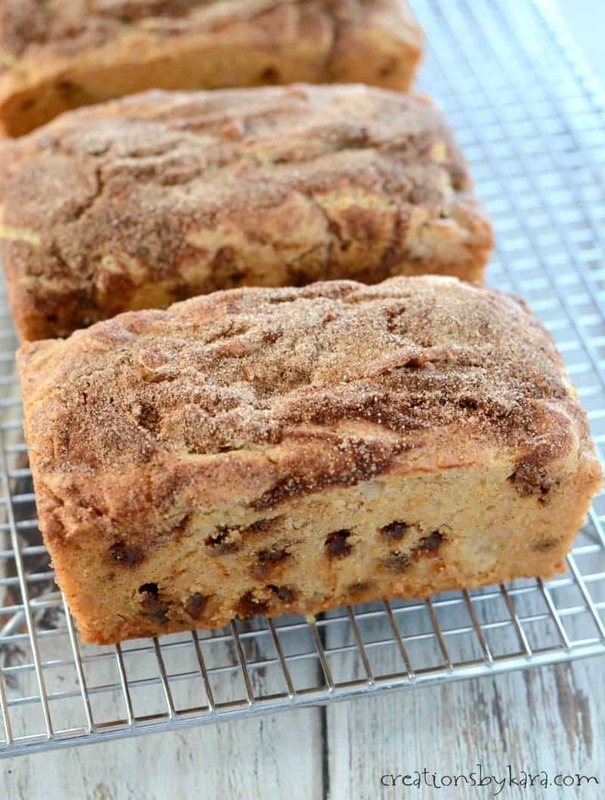 If you love cinnamon sugar, you must give this bread a try. 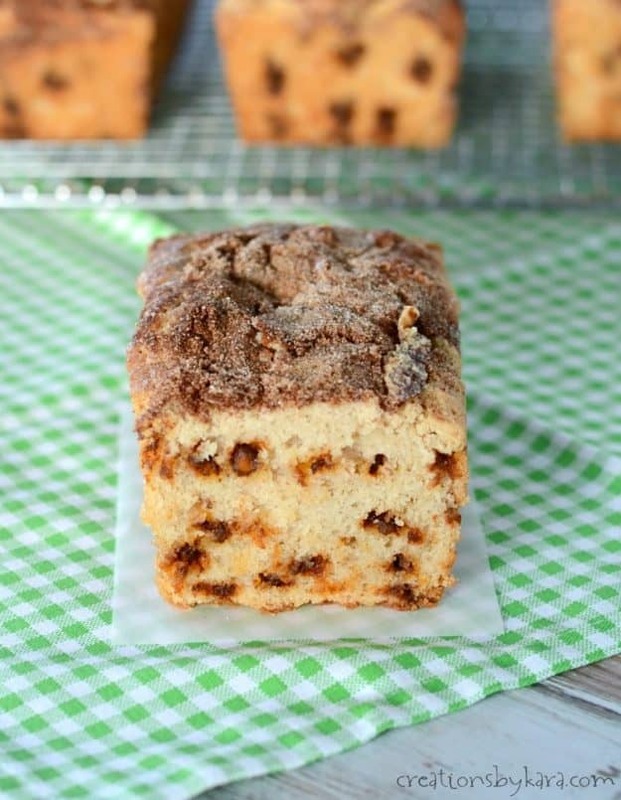 It is tender and moist, and full of great cinnamon flavor. Every bite just melts in your mouth. 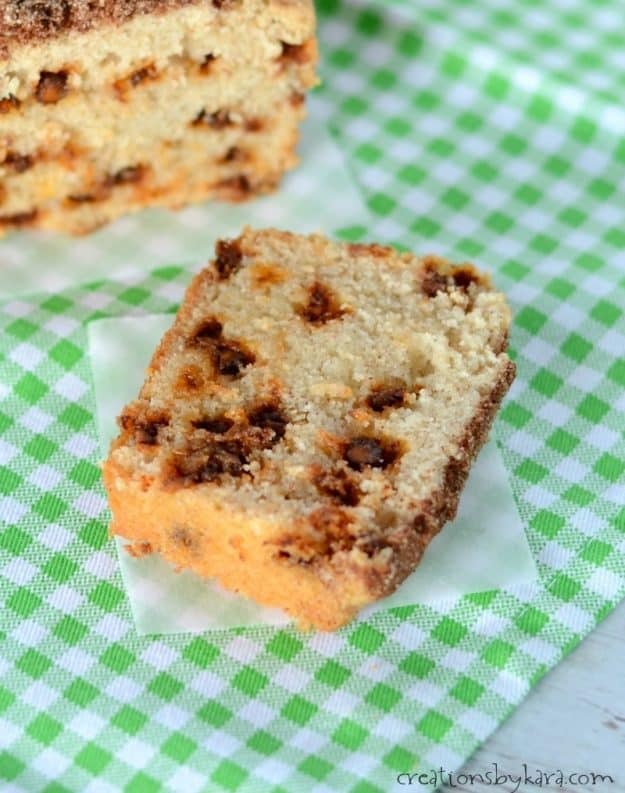 It is one of the best quick bread recipes you will ever try! I got the recipe from my super cute friend Kristyn from Lil’ Luna. Oh my goodness it is delish! The cinnamon chips take it over the top. They used to only be available for the holidays, but my grocery stores stock them all year now. Hooray! I hope yours does too. If you can’t find them, butterscotch chips are an acceptable substitution, but cinnamon chips are the best. They do tend to stick to the pans though, so I recommend lining them with parchment paper. 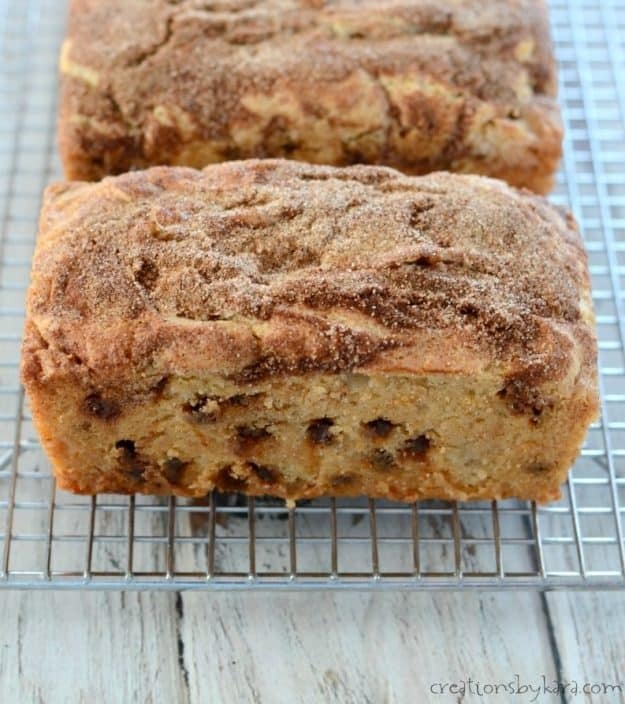 Tender quick bread filled with cinnamon chips and topped with cinnamon sugar. Cream butter and sugar in a mixing bowl till fluffy. Beat in eggs, vanilla, and sour cream. Stir together flour, baking powder, salt, and cinnamon in a small bowl. Add to wet ingredients and stir lightly. Add the cinnamon chips and stir till combined. Divide batter into 4 mini loaf pans (mine are 5x3") that have been well greased and lined with parchment paper. Combine topping ingredients and sprinkle over the batter in each of the pans. Bake at 325° for 45-50 minutes. Cool for 5-10 minutes before removing from pans onto cooling racks. -The cinnamon chips tend to stick to the pan, so use parchment paper for best results. I added a pinch of nutmeg, one fresh apple cut up some walnuts and I can’t wait to taste them…smells so good baking. My mini loaves looked great in the oven….had added a few minutes to cooking time. Took them out to cool….checked them after 10 minutes…the tops dropped thru to the bottom ….looked like sinkhole in Florida. Taste great…look horrible. Sorta under done. Plan to crumble, add cream cheese frosting, dip in candy coating and make Snicker doodle cake pops. Will have insulin on hand. Danggit, I’m sorry your loaves sank. I hate it when that happens! I live at a high altitude, so I sometimes have to adjust recipes. But luckily, they still taste great even with a hole in the middle. The snickerdoodle cake pops sound amazing though! I made this twice with the exact same ingredients, and both times it didn’t get done. In fact, I had to put it back in the oven for an extra 15 minutes after it cooled. Tastes great. First batch wouldn’t come out of the pans, so I cut off the aluminum. It doesn’t slice. Sure wish this would work, because it tastes sooooo good. I can understand the difference in baking times. I have two ovens and both of them vary greatly. It’s frustrating. I haven’t ever had trouble getting this recipe out of the pan, so I’m not quite sure why it stuck. I would suggest prepping the pan with shortening and flour, then lining the bottom of the pan with parchment paper. That works every time for me! Past the taste test. Both husband & daughter loved them. Yummy!!!!!! I put every thing together but instead of mini loaf pans I always make my breads into muffins. So this is my 1st time with this recipe so lets wait and see how they turn out. Can’t wait for the taste test. I made this a couple of weeks ago but I added 4 ripe bananas to the recipe and chopped walnuts – OMG delicious. My daughter just asked me when I was going to make it again. Thanks for the recipe. Oh my, that sounds delicious! I have a few bananas I need to use up, so I just might have to give it a try! I know this is wrong wrong wrong but I do not own mini loaf pans nor do I know where my regular loaf pan is. Do you think they would turn out the same if I baked them in a muffin tin? It’s not snicker doodle if there’s no cream of tartar. Why four loaves? Can’t we bake a bundt or a 9×13 or such? You could definitely bake it in a bundt cake pan or 9×13″ pan. It would take longer to bake, but should still work. I like the mini loaf pans the best because the middle cooks faster, so the outer crust doesn’t get as dark. If I make it in a regular loaf pan – do I need to cut down the ingredients in half ? What is the cooking time if we want to make in a regular loaf pan? I haven’t tried that yet, but I bet it would be 60-65 minutes in a regular loaf pan. I don’t have cinnamon chips and don’t know where to buy them. Can I make this and just leave the chips out? Walmart sells the cinnamon chips. They are Hershey brand. Hi Kara! 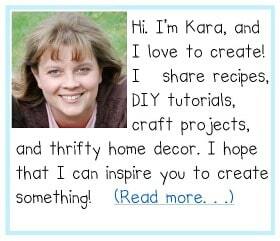 I just found your blog today and I LOVE it!! We should be friends! My mouth is watering from this bread!! That looks amazing! I would love it if you stopped by my little slice of the blogosphere! Hi Talitha! Checked out your blog today and I love it! Those solar jars you came up with are so awesome that I had to pin them. Such a great idea! They do grow up too fast. I’m sure your kids loved coming home to your scrumptious bread. It’s one of my favorite recipes I’ve created. That looks and sounds delicious! I am going to have to try it. I still need to try and make this – everyone who has loves it! Yours looks awesome!